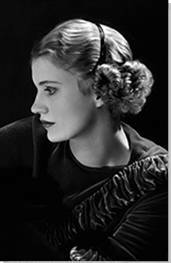 The below artworks are the most important by Lee Miller - that both overview the major creative periods, and highlight the greatest achievements by the artist. Artwork description & Analysis: Ordinary things, framed to detach them from context to dreamlike or humorous effect recur in Miller's early photographs of Paris. Here, four white rats perch side-by-side in an ambiguous space. Their little white rumps are brightly illuminated, and leafy shadows dapple the vague space around them. The rats were most likely living in a market stand amongst other domestic animals for sale, but their positioning, dramatic lighting and close cropping give the scene a fairytale ambiance. French photographer and noted flâneur Eugene Atget won the admiration of the Surrealists for his idiosyncratic, atmospheric views of Paris, and his influence can be discerned in Miller's early street photography. 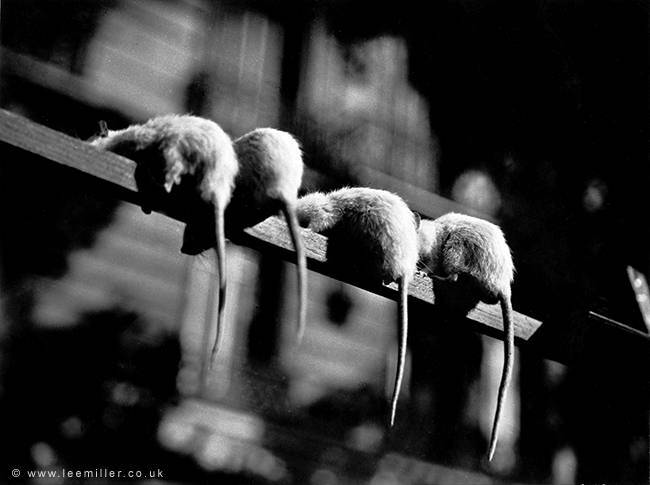 Untitled (Rat Tails) shows technique inspired by Atget's work - lighting that creates atmosphere rather than detail, cropping that eliminates any sense of context - to create a mysterious, intriguing image from a common scene. In addition to an eye for the uncanny, Miller also displays a talent for grasping what Henri Cartier-Bresson later defined as the "decisive moment", foreshadowing her later success as a photojournalist. Artwork description & Analysis: Anglo-German film star Lilian Harvey posed in Miller's New York studio. 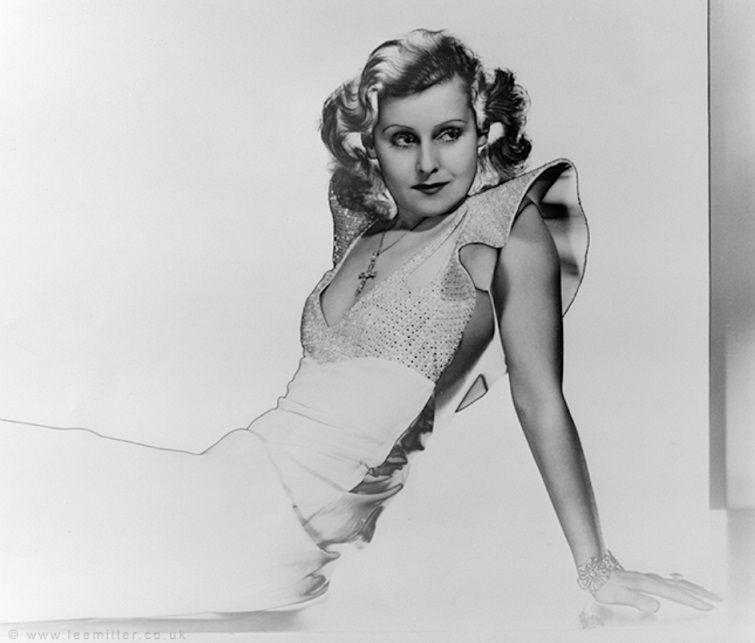 Elegantly attired in a sequined, satin evening gown, the actress is seated with her (cropped) legs outstretched, leaning on her left arm. Her gaze is directed over the supporting shoulder. However, this conventionally glamorous pose is made strange by the process of solarization. By deliberately over-exposing the film during development the resulting images are partially negative, with blacks and whites reversed. The materiality of the figure is completely out of balance: her supporting hand fades in to a fog, while the definition between the ruffled sleeve of her dress and the background space is clearly defined with a black outline. Stark contrasts in her hair create a topographical surface, while her outstretched lower body is completely flattened, appearing almost graphic. This treatment of the figure recalls her son's statement that as a fashion model, "Lee was used to people looking at her as a thing rather than as a person". The technique of solarization here visualizes that feeling, breaking down the coherence of the whole figure and dissolving the barrier between model and surrounding space. Aside from the technique apparent here, the confident gaze and slight smirk of the subject illustrate Miller's definition of a good portrait: Catching the subject "not when he is aware but when he is his most natural self" was her goal. Like the best of Miller's work, this seemingly straightforward portrait turns something simple on its head, infusing a glamour shot of an actress in a pretty dress with a disorienting blur of unreality. 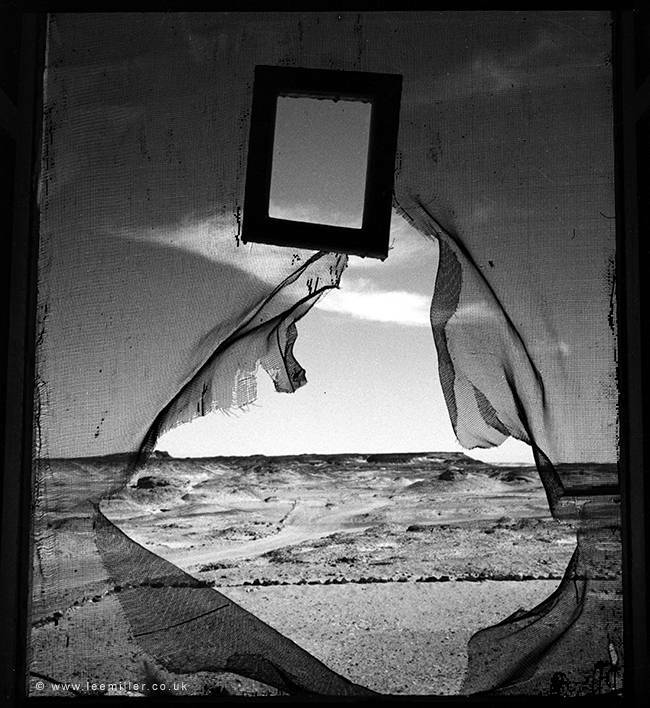 Artwork description & Analysis: Taken from inside a tent near Siwa, Egypt, Portrait of Space looks out onto a desert landscape, through a torn mosquito net "window." A dark wood picture frame in portrait orientation hangs from the net above the tear. The landscape outside the window begins with a flattened, manicured foreground, surrounded with a border of stone. Beyond, a natural desert scape stretches to the horizon, marked by a discursive path, stones, and small hills. The sky above, occupying about 2/3 of the image, is punctuated with a few wispy, elongated clouds. Miller's Egypt photos, this example in particular, embody the Surrealist impulses Miller developed early in her career while working with Man Ray in Paris in the late 1920s. The ideas associated with the movement, though, appear in Miller's work in subtle ways. Here a play on ambiguity and the permeability of boundaries are the most prominent. The title itself sets up an intellectual exercise. This "portrait" lacks the conventionally required subject and provides multiple "frames" - the dark frame around the whole image, the net, the tear in the net, the actual small frame dangling at the top and the stone border around the campsite. This sets up the viewer to determine what space is the subject of this subject-less portrait. Portrait of Space can be viewed as a "mise en abyme" or an image-within-an-image, "in which notions of inside and outside, are endlessly placed and displaced", as described by Patricia Allmer. Like her dematerializing portraits, Portrait of Space confronts and challenges the viewer with its details, made possible by the artist's unique vision and honed sense for presenting a slice of dislocated reality. 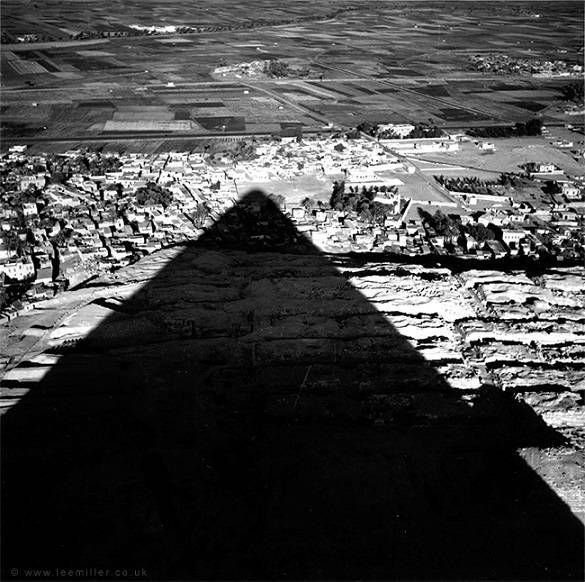 Artwork description & Analysis: This image, taken by Miller whilst living in Egypt with her first husband, shows the huge triangular shadow of the Great Pyramid at Giza on the village of Nazlet El-Samman below. It is an inversion of the classic touristic image of the pyramid, where the focus would be the monumental structure against the open sky to emphasize its size and imposition on the horizon. Miller's image, by contrast, places the viewer looking down on the everyday lives of Egyptians, living and working in the shadow of history. The focus on an unusual detail and its idiosyncratic perspective reveals Miller's debt to other Surrealist photography that isolates or foregrounds a particular close detail for effect (in this case the immense shadow). Miller's inversion of perspective raises questions about the weight of history and its looming presence on the everyday, and perhaps also of colonial narratives. Egypt was still part of the British Empire at the time of Miller's residence, and the picture could be read as an attempt to look beyond the internationally recognized symbols of a country to the realities of life for the majority of its citizens. Miller never really felt at home in Egypt as an American and bohemian free spirit in a conservative Arab country, and the image echoes both her remoteness as an observer and the distance between the Egypt of myth and reality. 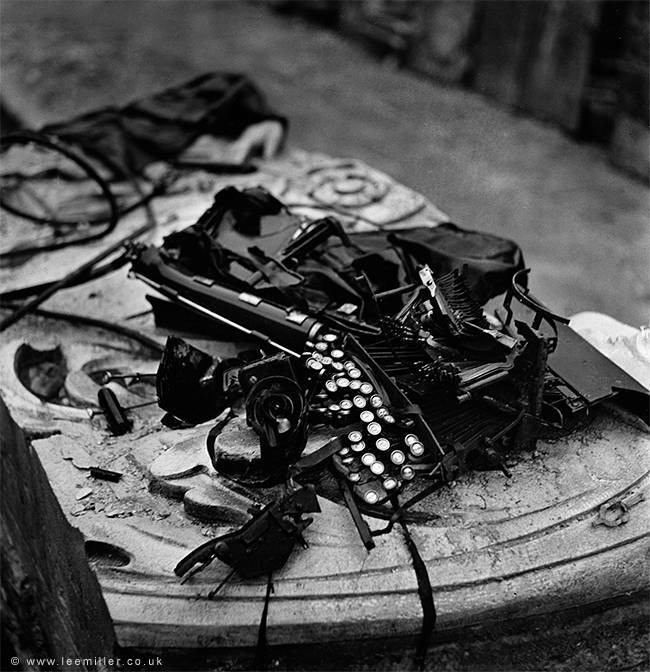 Artwork description & Analysis: A crushed typewriter sits on a carved architectural detail. Its keys form a tangled cascade with the ribbon, which then streams over the edge of the carved stone block. The focus fades quickly away from the viewer, but other sorrowful-looking detritus lies on the same stone behind the shattered typewriter. The in-focus objects are out of place - the bit of a building should not be horizontal on the ground. The mangled typewriter is rendered useless. Among Miller's photographs of the London Blitz of 1940, published the following year in a book entitled Grim Glory: Pictures of Britain Under Fire, this image refers back to her Surrealist compositions in Paris. Unlike the deliberately context-free images of the 1930s, Remington Silent is visually ambiguous but contextually specific. Edward R. Murrow's introduction to Grim Glory states that "this little book offers you a glimpse of their battle. Somehow they are able to fight down their fears each night; to go to work each morning". Miller's photo encompasses the contrast between the terror of destruction and the necessity of living. The title has a whiff of humor as the Remington Silent was a popular typewriter model, although this particular typewriter has been rendered silent by the previous day's bombings. Despite this specificity, the composition's tight focus on one humble object, made unfamiliar and abstract in its destruction, displays Miller's ability to create dislocations within the everyday. The effects of bombings created the odd juxtapositions that Surrealists labored to imagine. Cecil Beaton described this phenomenon as "the unfathomable laws of blast" that "scattered cherubs wings and stone roses...yet the lamp post [stands] erect with no pane of its lantern broken". Miller found easy inspiration in these baffling cityscapes. 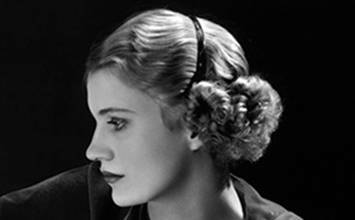 Anthony Penrose perhaps most clearly illuminated the uniqueness of her work in this period in The Legendary Lee Miller: "Lee's Surrealist eye was always present. Unexpectedly, among the reportage, the mud, the bullets, we find photographs where the unreality of war assumes an almost lyrical beauty. On reflection I realise that the only meaningful training of a war correspondent is to first be a Surrealist - then nothing in life is too unusual." Artwork description & Analysis: Taken while on assignment for Vogue magazine, this photo bridges Miller's work as a fashion photographer and as a war correspondent. 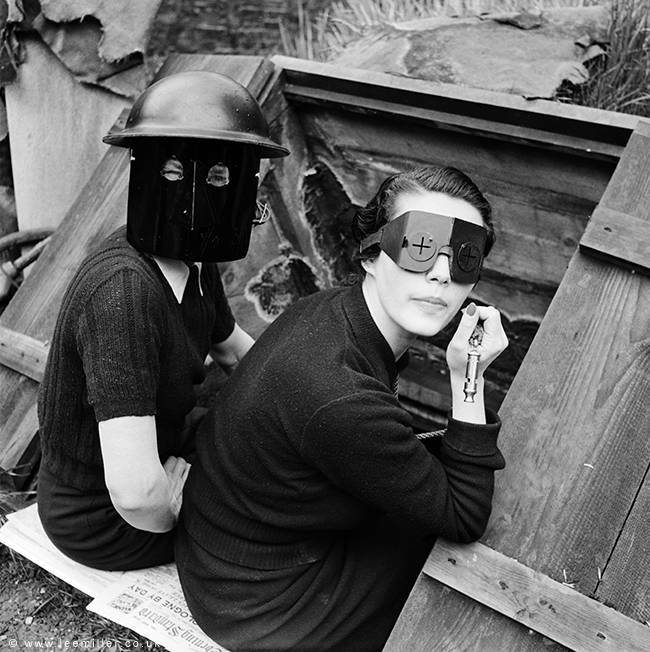 Two models, wearing Air Raid Precautions masks sit casually on newspapers at the entrance to Miller's bomb shelter at her home in North London. The woman closest to the camera dangles a warden's whistle in her manicured fingers, held next to her face like a piece of jewelry in an advertisement. Behind her, a woman with her face fully covered appears to be grinning behind her protective mask, her crinkled eyes the only visible part of her face. Miller's playfully dark sense of humor is evident in this image, as well as her consistent interrogation of a woman's place in the world, and the permeability of boundaries. Placing glamorous women who are customarily depicted in flawlessly aspirational settings on the ground, their faces covered with metal, reflects the dangerous days of the Blitz in London, but her approach also retains an element of fish-out-of-water humor. The truth of Miller's assertion in a 1932 interview with the New York Evening Post that it is the "personality of the photographer, his approach that is really more important than his technical genius", comes through in this image. Firemasks has an element of propaganda to it, as well. During the period, Vogue and other media outlets were obligated, according to the British Ministry of Information, to influence readers' wartime behavior. Images such as this showed women adapting to war, however cheekily, and carrying on as normal. Artwork description & Analysis: As a member of the London War Correspondents Corps, Miller joined the Allied forces during the liberation of Western Europe in 1944. She travelled to Germany in 1945 and captured this image of the suicides of the city's Nazi vice-mayor and his family in Leipzig. The closely cropped view, showing only the daughter and wife of the official, removes extraneous detail and focuses on the individuals. The women, dead for some time, lie slumped on the formal office furniture. A map lies on the ground next to the daughter, who chose to die in her starched nurse's uniform. Vogue published the photo, and Miller's accompanying article described how the high officials "gave a great party, toasted death and Hitler and poisoned themselves". The article also remarks upon the daughter's "extraordinarily pretty teeth," and her "nurse's uniform... sprinkled with plaster from the battle for the city hall which raged outside after their deaths". 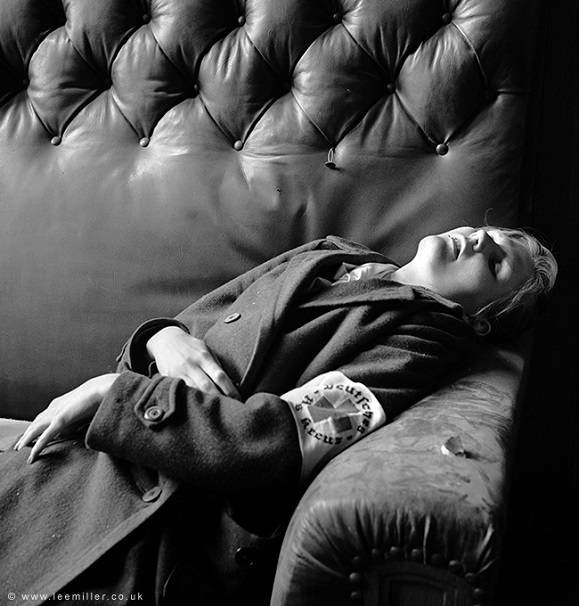 While other examples of Miller's wartime photos - particularly those from Buchwald and other concentration camps - are more brutal, The Burgermeister's Daughter particularly shows her consistent and unique interrogation the role of women as perpetrators in Nazi Germany. Miller, in her uniquely provocative and unvarnished manner, questions if anyone, even a teenaged nurse with nice teeth, can be an innocent bystander in times of war. Aesthetically, this photograph and its accompanying text affirm Becky Conekin's description of how her work "broke down barriers between fashion and war reportage. Her wartime pieces overflow with rich descriptions of her sensual impressions of the scenes of war around her-sounds, smells, and especially sights. Those scenes, as well as details of clothing, bodies, and hair, were frequently described in terms of high art". 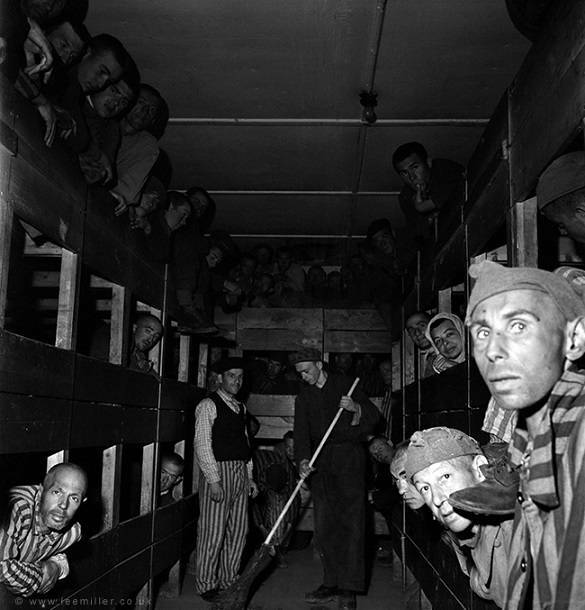 Artwork description & Analysis: This image, taken at Dachau Concentration Camp in 1945 shortly after its liberation by the American 6th Army, shows several prisoners peering at the camera from their bunks whilst another sweeps the central aisle. It is an image that offers a poignant emotional connection with prisoners who have been treated as less than human by their captors, with their eyes the focal point of the image. Miller's images from the Nazi concentration camps like this one still show hallmarks of her visual style, including multiple layers of focus and a close attention to textural detail. Miller arrived in Dachau very soon after its liberation with LIFE photographer Dave Scherman, and like many of the correspondents could not believe the scale of the carnage and travesty of what they saw at the camps. Miller also reported the disbelief that greeted the sight from the soldiers, some of whom even went as far as to suggest this was an elaborate propaganda stunt by their own side. Miller later cabled her editor with the message 'I IMPLORE YOU TO BELIEVE THAT THIS IS TRUE'. During her time at the camp Miller, as an attractive woman in combat uniform, fascinated the prisoners and she was invited into their bunk houses for the purposes of documenting their squalor. Miller also photographed guards who had attempted to escape the camp and been were in turn attacked by the tortured and brutalized prisoners.